Liver recipient, Debra Harkness (left) and double lung recipient, Damita Barbee (center) of Antioch at the opening of the exhibit on Friday, April 4, 2019. Photo by Donor Network West. 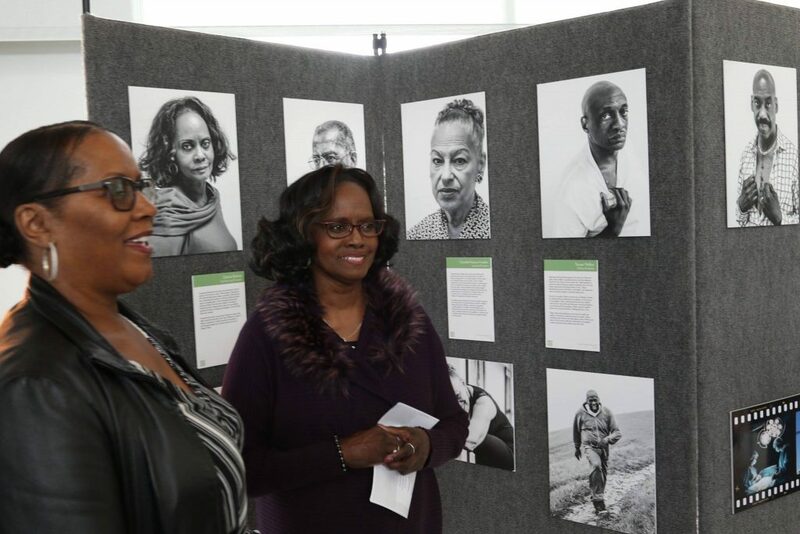 The “Giving Me Life: A Visual Journey of African-American Organ and Tissue Transplant Recipients” art exhibit has officially opened at the Alameda Health System (AHS)-Highland Care Pavilion Lobby. AHS has partnered with Donor Network West, the organ and tissue recovery organization for Northern California and Nevada, to bring “Giving Me Life” to AHS. The exhibit underscores the need for more registered donors within the African-American community through social documentary. April is Donate Life Month and the exhibit will be on display at Highland until April 30. Antwone Johnson, the brother of organ donor Anthony Johnson, gave a very emotional testimony at the ribbon-cutting ceremony on April 4. In addition, Johnson shared that he is humbled to be able to save someone else’s life through his decision to donate his brother’s organs. Currently, African-Americans make up 5% of the 13 million people in Donor Network West’s donation service area, however, they represent 10% of those waiting for organ transplants in the region. The exhibit is a visual testimonial of nine local African-American transplant recipients who have overcome incredible obstacles in their respective journeys toward health and wellness thanks to organ and tissue donation. “We are pleased to collaborate with Alameda Health System to bring the Giving Me Life exhibit to Highland Hospital in Oakland, which boasts a proud legacy of African-American culture, art and social justice. We deeply respect Alameda Health System’s commitment to promoting healthy equity and access for all patients, 30% of whom are African-American. Our hope is to spark new conversations, and inspire more African-Americans to register as organ donors,” said Janice F. Whaley, Chief Executive Officer of Donor Network West. Damita Barbee, a double-lung transplant recipient from Antioch, and one of the people featured in the Giving Me Life exhibit will be traveling to Italy this year, something she was not able to do five years ago. She was diagnosed with pulmonary fibrosis, but is now thriving. In her spare time she shares her story with others, hoping to encourage as many people as possible to become registered donors. “I am very passionate about finding solutions that will help our patients live healthy lives. There are many people on the transplant waiting list and this exhibit is a great way to raise awareness about the need,” said Luis Fonseca, AHS Chief Operating Officer and Donor Network West board member. About 50 people attended the event. Participants included Donor Network West Ambassadors, transplant recipients, donor families, AHS staff, community members, and representatives from Congresswoman Barbara Lee and Assembly Member Rob Bonta’s office. Nearly 1,400 people are waiting for an organ transplant in Alameda County. One organ donor can save the lives of up to eight people and a tissue donor can heal 75 others. Anyone can register as a donor at DonorNetworkWest.org or at the DMV. Sasha Jordan. Photo courtesy of Mark Jordan. University of California Davis senior, Sasha Jordan is interning for State Senator Steve Glazer (D-Orinda) this spring. Glazer, who represents the 7th Senate District including most of Contra Costa County and portions of Alameda County in the East Bay, currently has three interns but Jordan is the only intern from Contra Costa County. Jordan is an Antioch resident and graduated from Deer Valley High School in 2015. 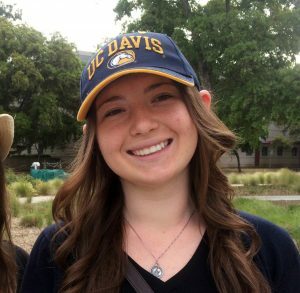 She began attending UC Davis that same fall. While at Deer Valley she was active in the Performing Arts Academy. Jordan will graduate in June this year with a degree in Political Science and minor in Communications. 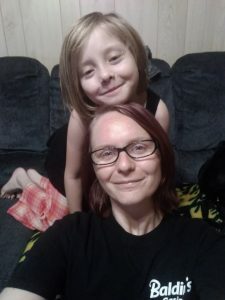 She had worked as a teen and young adult for the real estate company owned by her parents Mark and Cynthia Jordan, a local Certified Public Accountant and a local Attorney. She also had worked for the University as a resident advisor during her sophomore year at the Tecero Dorms on campus. Jordan is currently applying for fellowships at the State Capital in Sacramento and is looking forward to a career in government. “I think it is a good thing to help other people and government is just one way to make a difference” she said. Her internship will last until March 15, which is the end of the Winter Quarter. Jordan will graduate at the end of the Spring Quarter in June. Photos by Antioch Police Department. Today, (Wed., Dec 26, 2018) is a bittersweet day for us as we congratulate Sergeant Will Dee on his well-earned retirement, but we also have to say good bye to him as well. Will was born and raised in Florida, and ultimately found his way to California after enlisting in the United States Coast Guard In 1987. During this time, he was stationed in Alameda, but also did law enforcement patrols up and down the west coast of California and as far north as Alaska. After serving for five years, Will then attended the Napa Valley Police Academy. Upon his graduation from the academy, he was hired with the Moffett Field Police Department in 1993, where he stayed until he joined us in 1995. During his time with Antioch, Will has held multiple assignments including patrol, community policing, fraud investigator, homicide investigator, SWAT, Field Training Officer, and firearms instructor. Will was promoted to the rank of Police Corporal in 2002, and later again to Police Sergeant in 2008 where he has remained since. After he signs off for his final graveyard shift, he can know he’s touched many of us, made lifelong friends, and most definitely left this place better than he found it 25 years ago. We wish Sergeant Dee, the happiest of retirements and hope he enjoys it with his wife, children and new grandchild! 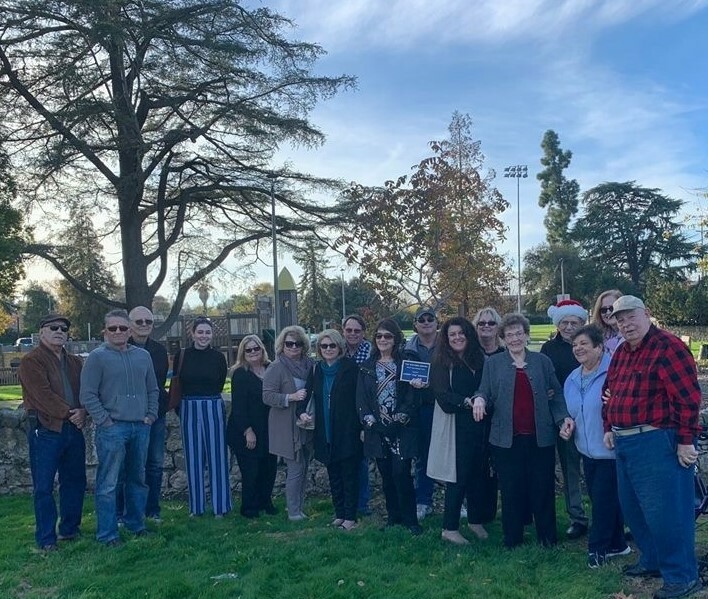 Jim Boccio, Sr. (fourth from right), with his wife Phyllis and Councilwoman Lori Ogorchock, is surrounded by his family and friends at the presentation of the plaque to be placed next to his tree in City Park. Photo by City of Antioch. 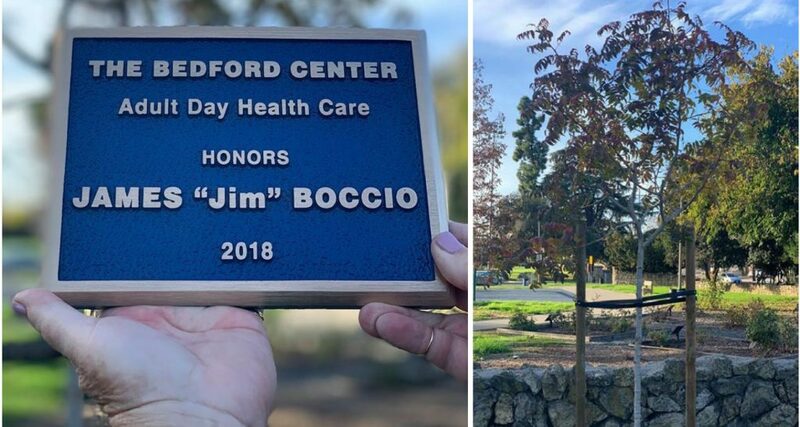 Friends and family, including Council Member Lori Ogorchock and representatives of The Bedford Center, met at City Park last week to present the dedication plaque to much-beloved champion of volunteering, Jim Boccio who selflessly devotes his time serving our senior community. The plaque will be placed next to Jim’s tree which City of Antioch Public Works has been caring for and nurturing since the planting ceremony in September. The Bedford Center offers Alzheimer’s Care, Adult Day Care, Assisted Living, and Nursing Care senior care options for elderly adults in Antioch. It is located at 1811 C Street. MERCED, Calif. — Over 140 students took part in UC Merced’s Fall Commencement ceremony on Saturday, Dec. 15, at The Art Kamangar Center in the historic Merced Theatre in downtown Merced. Students receiving their bachelor’s, master’s and doctoral degrees were honored together at commencement, with accomplished alum, and member of UC Merced’s first graduating class, David Do (’09) serving as the commencement speaker. Graduates included Marlon Wilson of Antioch with a Bachelor of Arts in Political Science. This was the second year that UC Merced held a fall commencement ceremony. UC Merced opened in 2005 as the newest member of the University of California system, and is the youngest university to earn a Carnegie research classification. The fastest-growing public university in the nation, UC Merced enjoys a special connection with nearby Yosemite National Park, is on the cutting edge of sustainability in campus construction and design, and supports high-achieving and dedicated students from the underserved San Joaquin Valley and throughout California. The Merced 2020 Project, a $1.3 billion public-private partnership that is unprecedented in higher education, will nearly double the physical capacity of the campus and support enrollment growth to 10,000 students.